-Phase focus blade will now extend Seha's hitbox. -Added Mandred Defense dungeon (tower defense style). -April fool dungeons are removed. -Union Arena rebalances, general and character specific(Affected characters: Yuri, Seulbi, J, Harpy, Violet). 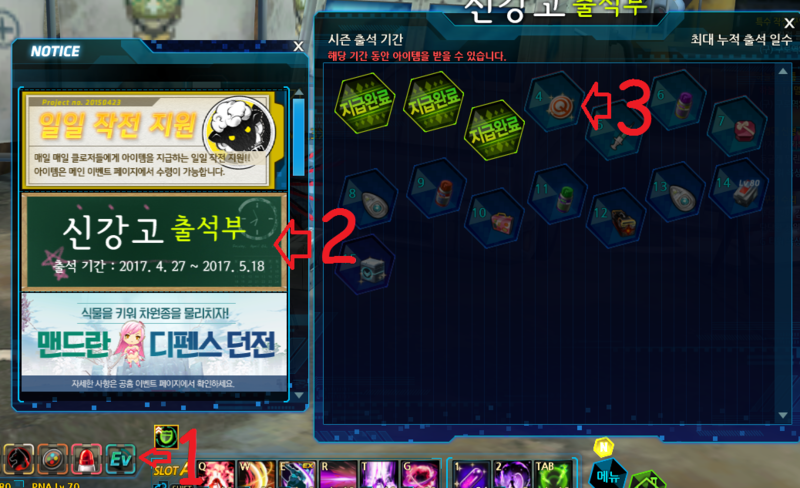 +Can acquire arena time reward at most 3 times a day now (either 3 win boxes, 3 loss boxes or a both as long as the total is 3). +Changed PVP Ranking rewards, added new items and costume pieces in the PVP craftable tab. +In case you are in the top 100 of your character's arena leaderboard by the weekly reset (Saturday KST), you can use ranked titles/illustrations for 7days. +Items have been adjusted to prevent buff effects from applying in Union Arena. -Warm Spa costume added (Through gacha, gothic pieces have been removed). -Dr.Gremory costume added (Cash shop). -Chick costume for all characters are available once again (event craftable, see event dungeon above). -Started the sale of the following: Dr.Gremory set, 4 types of Closers Sweet Package, Multi Dimensional crystal fragments (in bundles of 5/10), 2 hot springs mascots (room furniture). -Ended the sale of the following: Harpy pet packages, Tina/Violet costume packages, Collab premium packages, Union security agent packages. -New gacha costumes/serie, Warm Spa is the current gacha costume with an exclusive emote when owning 6 pieces (Hair, Top, Bottom, Shoes, Face, Lenses). -Re-organized gacha rewards [Can earn Lee Bitna stamp from gacha now, use it to craft new items from the gacha tab on crafting machine such as guaranteed cybernetic accessory/wing box). -Pet exploration skills have been changed, there will no longer be character-specific exploration skills. -Pet summoning function added (can now unsummon pets entirely from the room). -Pet dance button has been integrated on the bottom UI. -Can now skip cheering/watering scenes by pressing ESC. -First character that login on each account will receive the closers week gift box. -You can receive event items daily (for 15 day) for logging in and claiming them through the event tab. -Make sure to login during seulbi's birthday date (April 30th) as Seulbi to receive the happy birthday box. -Keyboard settings have been reset, they were changed to become account-bound instead of client-bound (In other words, logging in from another PC will keep your current keybinds now, and in case you login on a different account, it will have different keybinds than your main account's).